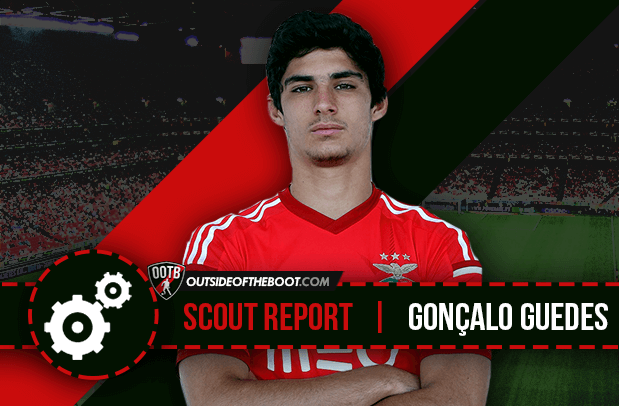 Alex Lynch writes a detailed scout report about Benfica’s exciting young winger, Goncalo Guedes. For as long as they have existed, SL Benfica have been at the top of Portuguese football with loads of top talent and great players. With the increased money in the game, Benfica have been forced to sell their recent stars. Angel Di Maria, David Luiz, Andre Gomes, Bernardo Silva, Ramires and others have been sold by Benfica in recent seasons. Despite losing these players, Benfica develops new stars to replace the old ones like Nicolas Gaitan and Eduardo Salvio. 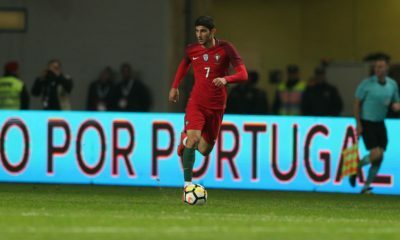 One of the newest young stars that Benfica has ready to replace the current stars of the squad, is one of Portugal’s finest young talents, and his name is Gonçalo Guedes. In 1996, Guedes was born in a small Portuguese town called Benavente. Benavente only holds 29,000 people, and Guedes comes from very humble beginnings. The 18 and soon to be 19 year old has only ever played for Benfica, joining their youth system at the age of 8. Guedes has risen through Benfica’s youth system rapidly since then. He made his debut for Portugal’s U-17’s in 2013 as a 16 year old, and played for the team in 2014 as well. In April of 2014, Guedes made his debut for Benfica B, in the Segunda division in Portugal. 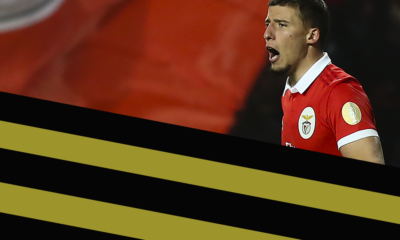 After impressing Benfica in the Segunda division with Benfica B, he made his senior debut in the third round of the taça de Portugal in October 2014, and his rise only continued from there. Continuing his impressive form in the Segunda division, Guedes made his Primeira Liga debut in January of 2015 as a substitute in a Benfica win. At the end of the season, Guedes won the Segunda division’s breakthrough player of the year award after the great season that he had. After getting his feet wet last season in the Primeira Liga, this season Guedes has become a first team player for Benfica. In 2015 Guedes has played for Portugal’s U-19’s, 20’s, 21’s and the senior team. He earned his first senior cap for Portugal in a friendly against Russia, after an impressive start to this season. Being an 18 year old, and playing for Portugal was an incredible achievement for Guedes. His good form this season has made him a top young prospect and one the big clubs want. After he scored his first Champions League goal against Atletico Madrid this September, he introduced himself to fans across the world as a bright young player we need to know. Goncalo Guedes plays a lot like most of the best wingers in the world play. It all starts with passing and setting up his teammates for Guedes, and then come the goals. In the Primeira Liga, Guedes has 4 assists in only 8 games this season, and last season he had an astounding 14 assists in 33 games for Benfica B. The 4 assists this season is a very impressive total for any player, especially when you factor in that Guedes has only played in 3 full games this season, and only started 6 times. Guedes’ ability to set up his teammates from the wing at a remarkable rate make him almost impossible to keep out of the lineup. The key to Guedes’ great passing ability is his awareness. He always knows where his teammates are on the pitch, which has helped him set up a Jonas tap-in in front of the goal this season, and an open long shot for Anderson Talisca which he scored on. In both instances, Guedes found open teammates even though he hardly even looked at them before delivering the ball. Besides being a great passer, Guedes is a great dribbler as well. Dribbling ability is something that all of the best wingers in the world possess, and Guedes constantly shows his ability to keep the ball and dribble by players. When setting up the goal by Jonas, Guedes dribbled by the right back before finding Jonas for the easy tap-in. His dribbling abilities allow for Benfica to maintain the large amount of possession they generally have in league matches. Guedes constantly dribbles past defenders on the wing to get a cross in the box or just to maintain possession. His ability to keep the ball is another reason why he’s played so much this season for an 18 year old. Besides being a great passer and an elusive dribbler, Guedes is has a good shot and is usually getting amongst the goals. He had 8 goals in 34 games last season, and this season already has 3 goals in the Primeira Liga, while he also has a goal in the Champions League. Most of Guedes’ goals are from shots in between the 18 yard box and the 6 yard box. Being able to convert chances in the box is a quality that Guedes definitely presents. His goal against Atletico Madrid was a great example of this, as he used his elusiveness to get through the defence and then he finished off the play from a very tight angle to beat Jan Oblak. In the league, one of his goals was an impressive shot from just inside of the box. Even with defenders in front of him, he got enough curve on the ball to get it into the back of the net for Benfica. The ability to take his chances in the box when given them is something that all of the best wingers do. Being an all round player this early in his career is why Guedes has become such a highly touted prospect. Despite getting off to such a fast start this season, Guedes has weaknesses in his game as well. One of his weaknesses is that he just started playing in the first division for Benfica. Having such a small amount of experience against solid competition is one of the main reasons why big clubs will be reluctant to spend a lot of money to get him. Despite playing in the Champions League, Guedes hasn’t done well in either of Benfica’s matches against Sporting CP, or against FC Porto. Which is a sign that he needs experience in Portugal before leaving for a big club like his predecessors. Guedes’ lack of experience shows on the pitch as well sometimes. He may hold onto the ball too long, or just do something on the pitch that is unrealistic or unnecessary, as he did against Atletico when he tried to take a long shot from a bad angle that sailed high over the goal. Another weakness that he has is that Benfica have the ball a lot and dominate a lot of their domestic games, which gives Guedes a lot of passing chances in a match. This isn’t his fault, but he gets a lot of time on the ball in Portugal and chances to help Benfica score. With experience he’ll figure out that he has to make quick decisions and can’t always run through the defense when he drops off the ball. His team might need to give him the ball back. With his first senior cap for Portugal happening just recently, the next step for Guedes will be to establish himself as a member of the team, and hope to impress enough to start or even make the 2018 world cup roster for Portugal. With Benfica, Guedes should stay with them for the immediate future, but a move to a big club is bound to happen. Just like his Portugal and Benfica predecessors, Guedes will likely move to a big European club if he continues his good run of form for Benfica. As he will likely be courted by either Premier League clubs, or the big two in Spain because of the money that they can offer. But before moving to a big club, or becoming an international hero, Guedes needs to establish himself at Benfica. Just like so many great players have, Guedes will try to make a name for himself in Portugal, because once you do that, the possibilities are endless. Alex Lynch is an avid Arsenal supporter for many years and is interested in football culture and tactics from across the world. His main focus is on the Premier League, Bundesliga and La Liga.